For many patients, including some of the people featured on this site, the fear of having dental work has led to years of neglect and deteriorating dental health. This fear is very real and often programmed from early childhood based on a bad initial experience. Although most procedures today including complex care can be performed with little or no discomfort this fear and sense of helplessness still creates great anxiety for some people. Dr. D’Angelo, Dr. Olson, and Dr. Hoffman offer sedation options including ORAL CONSCIOUS SEDATION and NITROUS OXIDE that enables even the most anxious patients to receive the dental care they need and want in a totally relaxed way. Each patient’s medical history is thoroughly reviewed prior to clearing them for any type of sedation dentistry. The best way to find out if you are a candidate for any of our sedation methods is to schedule a complimentary consultation appointment to discuss your options with one of our highly trained doctors! 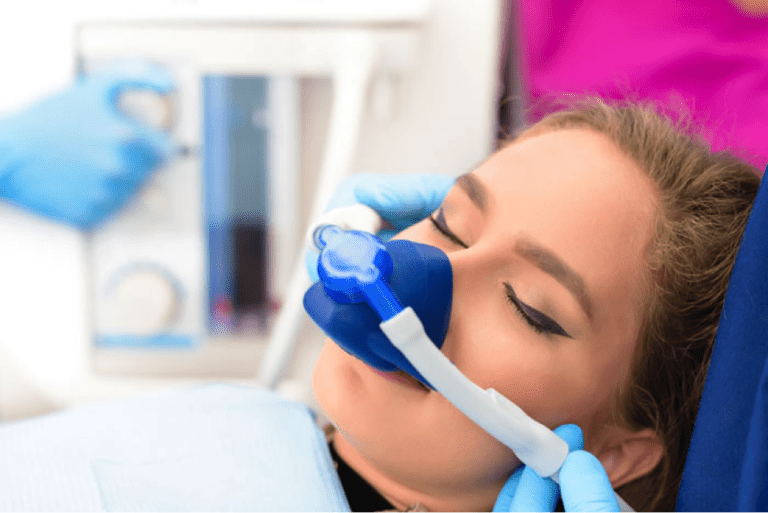 What is Nitrous Oxide and Oral Conscious Sedation? Sometimes referred to as “sweet air” or “laughing gas,” nitrous oxide is a safe gas that is breathed along with oxygen. Nitrous oxide greatly reduces anxiety and creates a feeling of well-being or euphoria. The effect begins within minutes and lasts only for the duration of the dental visit. Therefore, a patient can receive care in a very relaxed state yet is still able to drive themselves safely back to work or home. Oral conscious sedation is slightly different. This technique also creates a very relaxed state in which a patient is nearly asleep throughout their appointment. Our dentists often have their patient take a mild sedative the evening prior to their visit to help them get a good night sleep. This “evening prior pill” also helps the medication given during the appointment to be more effective and eliminates feelings of anxiety leading up to the appointment. Patients who use this sedation option usually report that their dental visit was very relaxing, and they will not remember much of the appointment. Oral conscious sedation has the added benefit of making long appointments seem short and therefore allows our dentists to provide much of the needed care in a single appointment. Patients DO need to have someone drive them to their appointment and take them home afterward.